As car sharing is re-shaping mobility market car manufacturers have very different approaches to this business. Daimler group takes mobility as part of their own business. Since few years ago Daimler mobility services gmbh is a full operating company within the group and it develops a wide spectrum of innovative services. Through the Moovel platform the group goes much further than cars sales, integrating services and booking for trains, bike sharing, local public transport and taxi. A long term vision is bringing the company to lead the industry. Other brand like BMW tested small-scale traditional car sharing (Drive now) making sometimes pilots to use electric vehicles (like Renault with twizy) or to pioneer corporate services. Most of the others prefer to push providing cars to make people drive them but not investing in running operations. 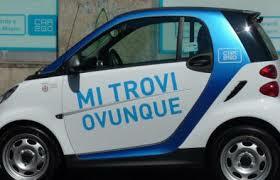 FIAT started to look at carsharing since early stage of introduction in national market in Italy (early 2000). By that time car sharing was a valuable promotional strategy to sell small fleets to local operators. In the city of Turin (Fiat headquarter at that time) the company is formal shareholders of local operators running more than 100 cars fleet. 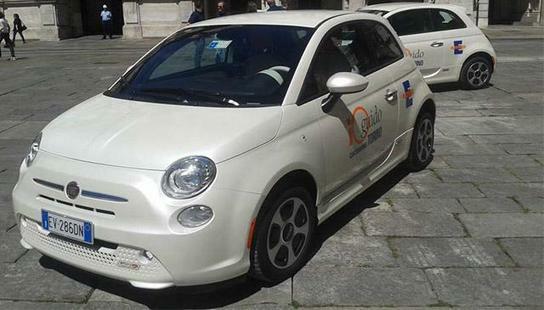 When national oil company ENI decided recently to enter into the free floating car sharing market Fiat become main partner to strength the Italian flag against German brand Car2go. 500 is official Enjoy brand vehicle according to the long history the car has for Italians ‘60’ 70 generations. partnership recently introduced by Getaround peer to peer car sharing operator and FIAT seems to go in this direction. According to official website Fiat offers a discount in car purchasing if customers share it with Getaround platform. User can earn up to $10.000+ per year and gets for free the “Getaround connect” device (priced 100$). Getaround doesn’t manage its own cars and the partnership is a valuable strategy to build a styling and glamour fleet that would make more attractive the service to new customers too. Car manufacturers thank you too. Sharing mobility is game changer, again! Since the last few years car sharing is changing personal and corporate mobility. Early start ups opened the market to rental models by hours and proved to became concrete businesses. Zipcar is a brand of AvisBudget group and keeps expanding operations in US and Europe. Local and national traditional car sharing operators grew in small scale models or become part of bigger networks. Especially in Europe we still see companies operating in city areas or nation based, not always being profitable with public funds. The most relevant innovation came by the free floating scheme. In Italy car2go and national oil company ENI owned ENJOY played a complete revolution in major cities like Milan, Rome and Florence, with more than 100.000 customers and for instance in Rome 15.000 rentals weekly. Free floating car sharing is easy to access and technology makes it appreciated by customers who also like glamour cars (Fiat 500 and Smart). While Autolib in France is the winning scheme proving that electric one way car sharing can impact on urban mobility with relevant Co2 emission reductions northern Europe markets still keep traditional schemes. 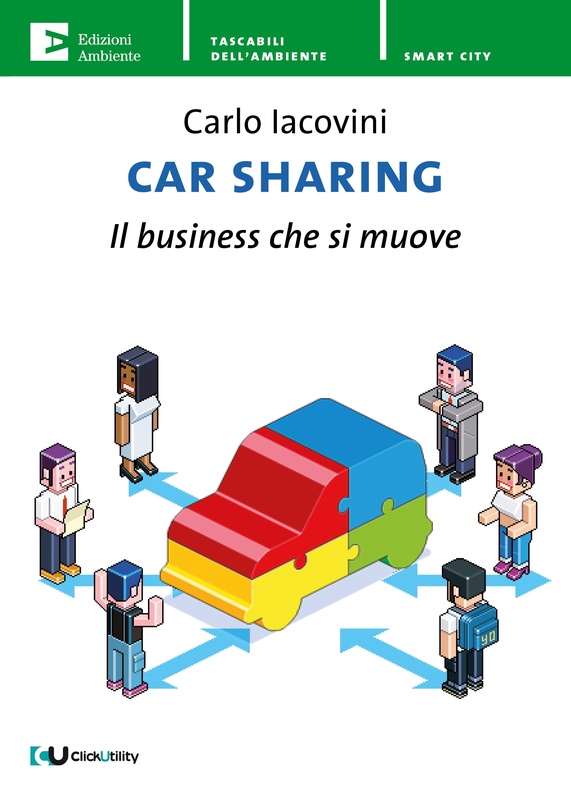 In my recent published book (“Car Sharing il Business si muove” Edizione Ambiente) I describe different international experiences and business case but the market is rapidly changing again. UBER or Lyft represent best examples of the first approach, even if with different positioning. Uber is giant google funded key player to mobility services with a discussed overestimated financial evaluation that brings the company to be bigger than Facebook operating worldwide but with recent accuses of inappropriate strategies, against competitors, privacy policies violation for customers or even journalists. Law is also an issue as in almost every country transportation has specific rules and taxi regulations and private services need to operate in a new legal framework, still to be defined. Uber plan surely doesn’t focus only on the existing services and the goal of the company is to reshape overall mobility system in cities around the world. There might be the chance they will make it. focusing on the opportunity for private people to share individual car to other members. 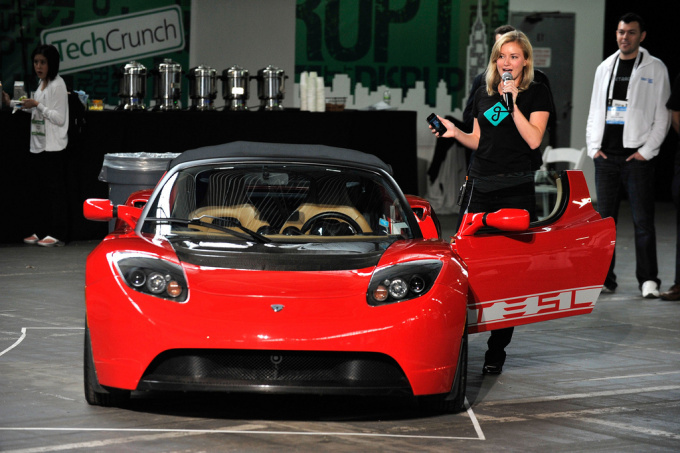 For those who area familiar with sharing economy, it’s like AIRBNB for cars. While Relay rides targets daily (or longer) rental, Getaround seems to have found what in Italy we call “l’uovo di Colombo” (“Columbus egg” means something very clever). 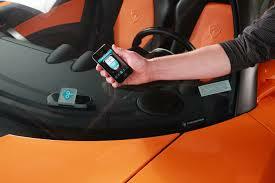 The GetaroundConnect is a device installed in the car allowing to open and to end the rental process with you phone. The keyless entry to vehicles makes easy to access even a private car because it solves the most inconvenient practical procedure (meeting to the owners and exchange the keys). This innovation increases numbers of vehicle available for customers, so the business itself. After few years testing in some cities Getaround just raised $24M round B funding from strategic partner Cox Automotive, to grow in US cities and improve operations. Considering number of vehicles parked on the streets for 80% of the day in bigger cities we bet that getaround is highly potential large scale business, not only in US but in Europe too specially where motorization index are insane (as in Italy). Si parla tanto della sharing economy, chi ci scrive addirittura un libro (il sottoscritto), chi la osteggia e la critica e chi magari la sottovaluta. Pensiamo che la sharing economy sia figlia della crisi (in parte può essere vero) o che sia un divertimento nato da tech company che hanno inventato le più innovative app del momento. Bene in questo breve post, da “esperto” del settore racconto un’ esperienza di vita vissuta. Una lunga trasferta lavorativa negli states è l’occasione migliore per avventurarsi nel mondo della silicon valley e bay area alla scoperta di come funziona una società in “sharing”. La California non è in crisi, anzi il senso comune qui è di benessere diffuso, dinamismo, imprenditorialità e start up, il paese delle opportunità. Ma il tessuto sociale è pervaso di “sharing economy”. L’appartamento dove stare? l’ho trovato con Airbnb, comodissimo, nella posizione giusta e a metà prezzo rispetto a qualunque residence “tradizionale”. Mi devo muovere in città? : Uber, Lyft e Sidecar, sono più popolari delle metropolitane e dei taxi. Anche qui c’è stata qualche battaglia ma alla fine la domanda e il mercato hanno vinto. Le tariffe dei viaggi sono anche della metà rispetto ai taxi, potendo scegliere tra tanti livelli di servizio (black car, vettura “economy” o anche car pooling insieme ad altri passeggeri). C’è la scelta per tutte le preferenze e le tasche. L’altra sera a cena con il CEO della più importante azienda di infrastrutture di ricariche per EV americana…ai saluti finali mi racconta come avrebbe chiamato Uber per andare in aeroporto. Mi ha mostrato la sua tessera ZIPCAR evidenziando come la miglior combinazione possibile sia avere tutti gli account dei servizi di sharing. Parlando con i drivers di Lyft e Uber si scopre poi che sono studenti che si mantengono in parte gli studi, che sono dipendenti di aziende che arrotondano negli orari di picco o liberi professionisti che promuovono anche il loro business. Insomma tutta l’economia è quotidianamente permeata di questi nuovi servizi, che hanno il grande plus di avere migliorato la mobilità e non solo. Non è solo questione di economia, di leggi e di innovazione, lyft, airbnb, rappresentano un valore intangibile di comunità, di fiducia nelle relazioni che è uno dei migliori asset. Andare a casa di “sconosciuti” era una cosa impensabile fino a poco tempo fa, ma diventa normale oggi, anzi diventa curioso per la possibilità di conoscere nuove persone, che sai, a monte, condividere una filosofia di comunità e di socialità… che rappresentano un valore riscoperto. Insomma, la sharing economy applicata è bella, comoda e nonostante i tanti ostacoli formali e normativi, non potrà che svilupparsi. Abituiamoci. Conviene. Alphabet has launched a fleet of demonstrator vehicles designed to boost the take up of corporate car-sharing among organisations in the public and private sectors.